If you are an outdoor enthusiast who dislikes heavy flashlights or lanterns, then, the Fenix e12 EDC flashlight is a great option for you. 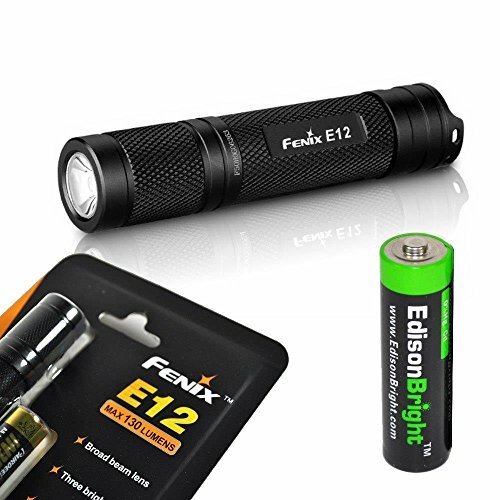 The Fenix e12 is a good example of a wonderful pocket flashlight that can function in different conditions. Being an upgrade of the fenix e11, the e12 comes with a lot more interesting features. It is an AA powered flashlight. Read this fenix e12 review to know more details. This light is well constructed from durable aircraft grade aluminum and has a hard anodized anti-abrasive finish. It can withstand impact resistance of up to one meter and as well be immersed in water up to 2 meters for around 30 minutes. Also, the light is lightweight weighing just 1 oz without battery. So, keeping it isn’t an issue at all. On purchase, the user gets a limited lifetime warranty from Fenix lighting US. 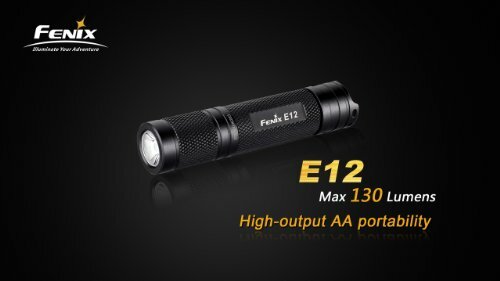 The fenix e12 is powered by one AA battery and has a maximum of 130 lumens. This is bright enough to light the tent, path or even room. The beam reaches a maximum of 88 meters. When switched on low lumens, the flashlight has the ability to run for 40 hours. In addition, it has a tail tap switch and reverse polarity protection. This is an edc small light if you need a more powerful flashlight, then check this fenix tk16 flashlight review. Sturdy construction – who doesn’t want a flashlight that they will rely on for the next 3 to 5 years? Flashlight is not some item that you will need to buy on a daily or yearly basis. That’s why it is crucial that you buy a quality and sturdily built light. The fenix e12 edc led light is built from sturdy aircraft grade aluminum and has a premium type III hard anodized anti-abrasive finish. These materials make it to be durable and long lasting. Simple operation – using this flashlight is very easy. Some people have complained about the switch but it is crucial to know how to use it so that it doesn’t cause problems. All you need to do is to press the tail switch until you hear a click. Also, you have to press quickly in order to select a light mode. 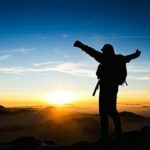 Lightweight and compact light – every outdoors person knows the importance of keeping weight low while going out. With such a portable and small light, you don’t have to worry about it taking much of your space in the backpack or purse as it can be kept in the pocket. The light weights 28.5 g without battery. So, you can enjoy your trip without worrying about the flashlight. Uses Cree Xp-e2 LED – since the discovery of the LED bulb, flashlights have changed a lot. This is because led has brought effectiveness and longevity. The CREE LED bulbs are not only powerful but as well produce a light that can be used in different conditions. The white beam is bright and reaches distant places. The beam produced by the Cree Xp-e2 led bulb covers a distance of 88 meters. This is really amazing. It as well has 50, 000 hour lifetime. 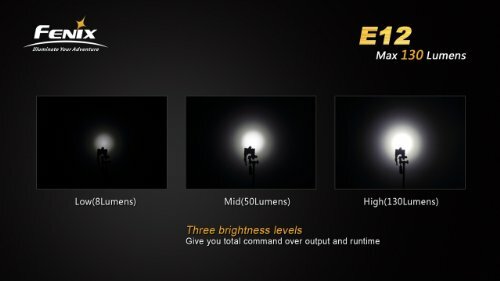 3 different light modes – one of the improvements made on the e12 light is that it has more lighting modes than the e11 series. This led light comes with low, medium, and high lighting modes. The lowest mode runs for 40 hours on 8 lumens, the medium mode runs for 6 hours on 50 lumens, and the high mode runs for 1 hour 30 minutes on 130 lumens. This allows the user to have control of battery use and the kind of light that they want. Reverse polarity protection – when in a hurry or in confusion, one can confuse and place the batteries the wrong way. This has happened to me and if you are a flashlight lover, there is a chance that you have undergone the same experience. The reverse polarity protection feature protects the light from being damaged when you place the battery the wrong way. 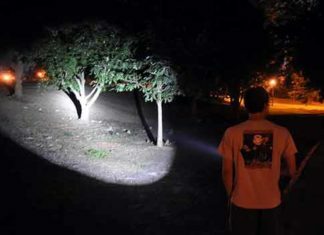 Tactical light – whether it is for home use or outdoor use, it is important to have a light that you can rely on. The fenix e12 is a powerful and reliable light in different environments. It can be used for survival, rescue missions or for just normal use. It is waterproof and can resist impact up to one meter. These are some of the features that make it to be reliable. Easy storage – due to the small size of the e12, the flashlight can be kept easily in the pocket or backpack. Also, it comes with a lanyard for tying the light on the belt or backpack. Great price – there are various edc flashlights on the market that cost highly than the e12 led light but perform poorly. This light comes at a very favorable cost but does what it says it does. So, it is worth every cent spent on it pr even more. Limited lifetime guarantee from Fenix lighting US – the good thing about Fenix is that they have a strong believe in their products and are as well known to be one of the best. The Fenix brand offers a limited lifetime warranty on the e12 flashlight. The fenix e12 can be powered by one AA Ni-MH or Alkaline battery. You can use a rechargeable battery as they are durable and run for longer hours than normal batteries. To insert the battery into the flashlight, unscrew the head of the led light. The edc flashlight has a simple UI button which is a reverse click. This implies that you when you push the on button, light won’t turn on until you hear a click and the release the button. After switching the light on, you will have to select one of the three light modes that the light comes with. It has no any peculiar blinking modes. To change from one light mode to another, you’ll have to press the button quickly so it adjusts and lands on either medium or high mode. Actually, it starts with low mode when you switch it on. Hope our Fenix e12 review has helped you know more about this small but durable edc light. It is an upgrade of the feni e11 and has several outstanding features. If you love flashlights that are durably created and can survive in different weather conditions, then this is the light to have. Use it as you camping, fishing, hunting, blackouts or even to change your car tyre. Despite its small size, its toughness makes it to be a great tactical light to always have with you. I hope this Fenix e12 review was helpful to you.